What do I want from a free game? Welcome to the Free Roleplaying Game Blog: review and commentary on free pencil and paper roleplaying games. Most GMs go through the process of scribing a campaign, tinkering with rules and creating with utter abandon. Some of those inventive types have kindly taken the time and effort in writing up their endeavours and have decide to share pro bono. I will attempt to showcase, review and enthuse about these free offerings to show that there is plenty of great gaming out there at simply the cost of your bandwidth. In this post I will be picking out my favourite free roleplaying resources from lists of free systems to campaign inspiration lists. Free lists and communities are essential to keeping free games alive because they provide linking to aid search engines to rank them. They also provide support for the authors who are seeking no monetary reward. If you're not keen in wading through swathes of links and homebrew pages, then I will be plunging in and picking out the gems in the future. Don't be fooled by the simple layout, John's list is still the most complete list of free full RPGs that is updated on a regular basis. Each game is given a link and a brief objective description - enough for you to get a flavour of the game before you click. Games are also classified by type, size and their file type (be it Word, PDF or HTML) is given. We can only hope John keeps this excellent list going with a bit of googling every so often. Created by Keeton Harrington, 1KM1KT is a free RPG host for those people who can't host themselves. 1KM1KT has long provided some space online for people to host the free games they might have crafted during Game Chef or the 24 hour RPG challenge. Others upload campaign settings or resources they created as part of their weekly game and didn't know what to do with it. There is a quiet community that offers help and support for writers. As a result, a browse through the archive will reveal some weird and wonderful games. If you've got something to share and are not sure where to put it, this is certainly a good start. Bias warning: I am an community Admin at 1KM1KT and have been spam-killing/modding there for years. The free RPG community is home to a few free RPGs that focus on truly free games, those that are copyright and "open source". You could take these games, modify and copy them and re-release under the same free license. Yet Another Game System (YAGS) and Fringe are the main games supported there but anyone is free to come along and extend or improve the content! 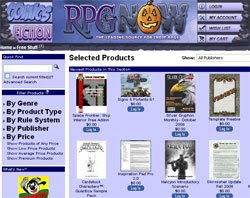 Although the core business of RPGNow is selling RPGs for cold cash, they do have an area for people to upload their free RPG supplements, lists and so on. The quality is mixed as it is quite often used as so-thin-its-really-marketing for full price supplements. This list is far from exhaustive. 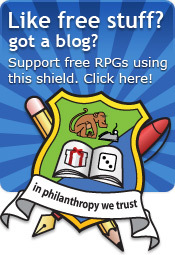 If there is a list or community resource regarding free RPGs, please let me know in the comments. Would you like to know more about any of the resources I've outlined above or perhaps the people behind them? Just comment-me-up and I'll see what I can do. Great job, Rob! Heavens knows you should have plenty of material to write about--there's plenty of Free RPGs out there awaiting a thorough look. Best of luck, and great idea! Thanks Zach, I have an enormous backlog of things I want to write about. I do hope that others will find it useful. Time will tell. Hey, Now I can link you instead of all the lists! Goo start. Hopefully, you'll help sort through the chaff. Thanks Stan, that's certainly my hope. I have a post as a sort of guide to creators of free stuff coming up. Hopefully it might help to point out free tools and simple things to raise the quality of free creations. For many, I wonder if its just a lack of feedback that makes it difficult to up the quality. Thanks for the link to the Free RPG Community, we appreciate it. No problem, Ricardo. Many thanks to you for continuing to support for the Free RPG community! You'll have noticed that I've posted up about Sam's Yags, I shall be moving through the rest of the FRPG Community, reviewing as I go! No problems Ragnorakk. I sympathise.